Cite des Arts, Acadiana’s Arts Incubator, is pleased to announce the appointment of Daniel Ladmirault as its new Program Director, replacing Christy Leichty, who has led Cite des Arts from Nov 2010 to present. Daniel brings over three decades of theatre experience to Cite des Arts at all levels, from community theatre to professional theatre, as well as film, video and television credits to his name. 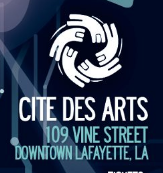 Daniel is excited about the direction in which Cite des Arts is headed and looks forward to serving the community in Lafayette and the surrounding area.